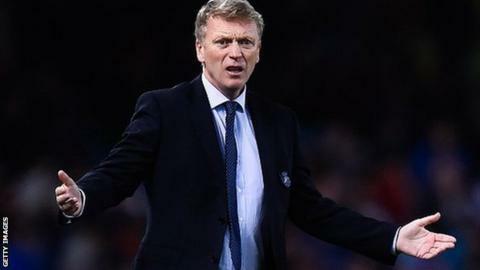 Manager David Moyes said he hopes to transform Real Sociedad into a side which can pack out stadiums, following his first win in La Liga. The ex-Manchester United boss, 51, saw a Carlos Vela hat-trick earn a 3-0 win over Elche on Friday with just under a third of the Anoeta Stadium empty. "I want the stadium to be full, I want a team where you can't get a ticket because it's a sell-out," said Moyes. "At the moment I've not got that, but that is what I am going to try to do." Moyes appointed former Watford manager Billy McKinlay as his assistant on Thursday and has started life in Spain with a draw and a win, results which include two clean sheets. But despite being "very happy" with a first win, Moyes wants to see more than the 23,000 fans who turned out - a figure close to their average attendance when finishing seventh last season. "I am pleased to have not conceded again, but I am not so happy with the performance," added Moyes, who drew 0-0 at Deportivo in his first game at La Real. "I thought we committed too many errors and I expected us to play better. "I thought the crowd were very good in the second half, but I want to give them a team so that there are no empty seats in the stands." Real Sociedad have finished 12th, fourth and seventh in their last three La Liga seasons. They are currently 12th. Sociedad sold key players in striker Antoine Griezmann and goalkeeper Claudio Bravo during a summer in which they made a profit of more than £20m on transfers. But despite not having the team he wants just yet, Moyes said his side were buoyed by what he calls a "special player" in Vela as they moved up to 12th in the table. They travel to Villarreal - currently eighth - next weekend in what looks likely to be Moyes's most difficult test in Spain yet.